For the last half-decade, Oregon football has been one of a handful of teams that has been, at some point during each season, a true contender for a national championship. For a variety of reasons they have fallen short of attaining this goal. They have come very close on multiple occasions, but have failed to close the deal. In each of those years the Ducks have also shown an uncanny ability to reload, instead of rebuild, and somehow manage to improve at nearly every position. Yet inevitably a time will come when a program peaks or plateaus and it may very well be that Oregon is reaching that point. 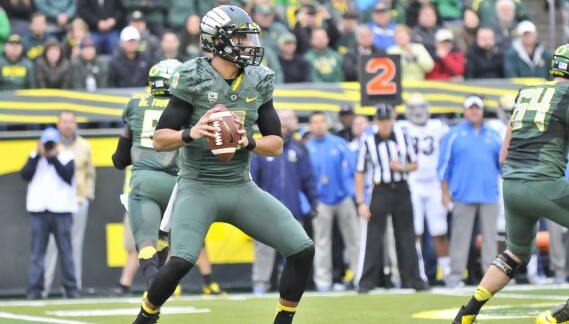 Marcus Mariota might be the greatest quarterback Oregon has ever had. He is the complete package. He throws with accuracy and strength, he makes excellent decisions on the field and he can run like a gazelle, attributes that have executives in the NFL eagerly anticipating his ascension to the next level. This will be Mariota’s last year in an Oregon uniform; it is a guarantee that he will be playing in the NFL next year. And meaning no disrespect to the quarterbacks waiting in the wings, but Mariota’s are some very big shoes to fill, and it is highly likely that the Ducks will take a step back at the position when the next generation takes over. 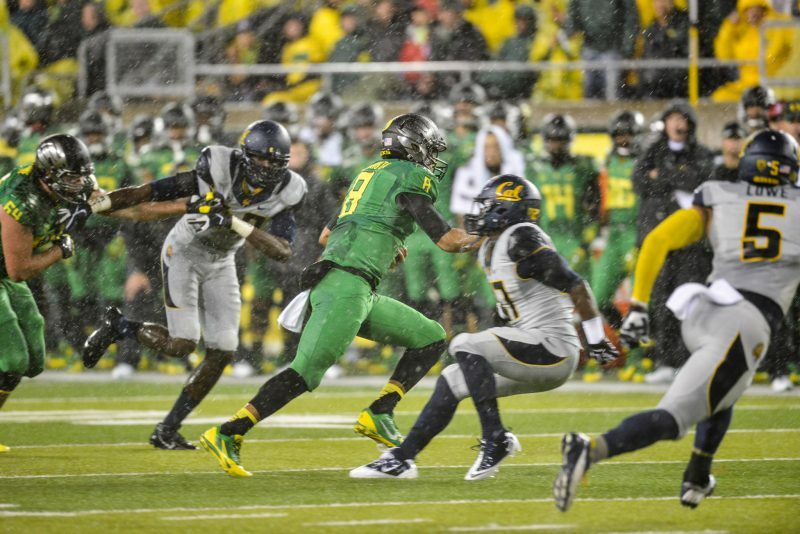 Mariota squirts through an opening in the Cal Bear defense. This season, Byron Marshall will be a junior and Thomas Tyner a sophomore. Both are quality running backs with a huge upside, but if next year’s quarterback is not as effective as Mariota, defenses will be able to focus more of their attention on the running game, making the offense prone to periods of stagnation, much like when Darron Thomas was at the helm. There is little doubt that Oregon will continue to field teams with great offensive potential, but after this year, Oregon will be much less likely to field teams that have national championship winning potential. Certainly players like Marshall and Tyner have the chance to become superstars, in this season or the next, but without the ability of Mariota running the show, their chances of winning it all diminish. This team has been building towards the ultimate goal for some time now. Last year seemed like a golden opportunity, but toward the end of the season, certain members of the team exhibited a lack of hunger and humility, and this attitude came back to haunt them in the losses to Stanford and Arizona. Hopefully this year’s team remembers what happened, and have a renewed sense of urgency, commitment and hunger. Should they fall victim again to those same entitled attitudes, they will not be in contention this year either. To complete the process, to achieve the goals and standards that have been established for this program, Oregon will have to remember how hungry and determined they were when Chip Kelly took over the program. They will have to return to the “us versus world” attitude that was so powerful. They will have to think like underdogs again, and regain that chip on their shoulder (no pun intended). This has to be the year. Even with such fresh faces on the defensive side of the ball, even though key players like DAT and Josh Huff have moved on, the time is now. Not in the future. Today, this week, this month and this year. This is Mariota’s time to stake his claim as not one of the best quarterbacks in Oregon history, but the undisputed best. Who knows what direction the program will go after Mariota has moved on to the NFL? Certainly, surprises happen and new players step up in unexpected ways, but there is little disputing that Marcus Mariota is special. There has never been a player like him before in Oregon’s history, and it is likely that there will never be one like him again. This is his year to shine, and seize the moment. This is Oregon’s year to be the best.